FREE VALUATION. To buy, auction, sell or consign your Joe Sinnott art that is for sale, please email Nate@NateDSanders.com or call the Nate D. Sanders Auction House (http://www.NateDSanders.com) office at (310) 440-2982. Top dollar obtained for your Joe Sinnott art. Joe Sinnott is a comic artist who mainly worked as an inker. Traditional comic book construction utilizes a penciller, who makes the drawing, and an inker who will then outline and retrace the drawing with pencil, pen or brush. The inker’s role requires interpreting the original drawing as well as correcting errors, and the final art can vary drastically depending on the inker. Joe Sinnott worked on Marvel’s Fantastic Four between 1965 to 1981 and retired from comic books to ink the Sunday strip for The Amazing Spider Man. The last Amazing Spider Man Sunday strip was published in March 2019 and marked Sinnott’s retirement at age 92. 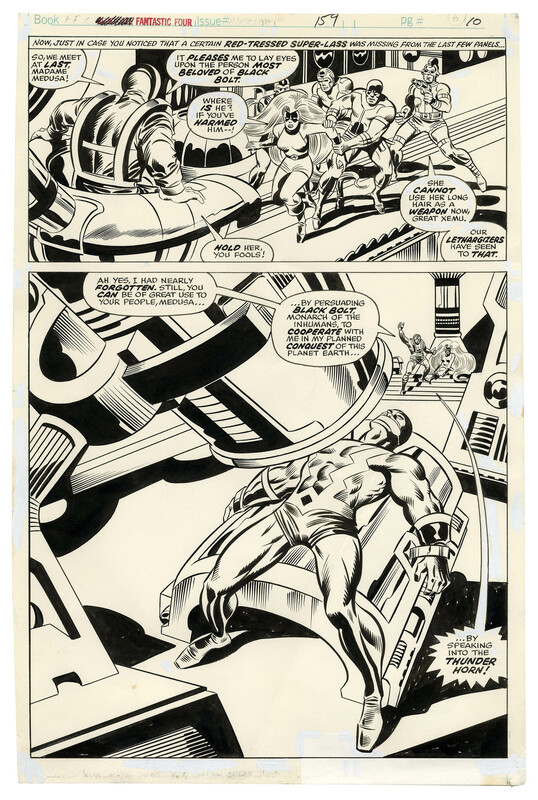 “Fantastic Four” original art by Rich Buckler, with inking done by Joe Sinnott from the June 1975 issue. In this attention-grabbing splash page, Medusa is brought before the Great Xemu, who tries to turn her against her cousin Black Bolt. Large two-panel artwork is from Volume 1, issue 159, and measures 10.75″ x 16″. Drawn on Marvel Comics illustration board. Some white-out present as common with original comic art. Crease to bottom panel, otherwise near fine. Marvel Comics Group copyright stamp to verso and catalogue information along top margin. Sold for $1,100. “Fantastic Four” original art by Rich Buckler. Inking by Joe Sinnott. Click to enlarge. FREE VALUATION. To buy, auction, sell or consign your Joe Sinnott art that is for sale, please email Nate@NateDSanders.com or call the Nate D. Sanders Auction House (http://www.NateDSanders.com) office at (310) 440-2982. Please let us know if you have Joe Sinnott art for sale. Top dollar obtained for your Joe Sinnott art.